Download "Chapter 2 Fields of Intellectual Property Protection"
3 Chapter 2 - Fields of Intellectual Property Protection 17 Patents Introduction 2.1 A patent is a document, issued, upon application, by a government office (or a regional office acting for several countries), which describes an invention and creates a legal situation in which the patented invention can normally only be exploited (manufactured, used, sold, imported) with the authorization of the owner of the patent. Invention means a solution to a specific problem in the field of technology. An invention may relate to a product or a process. The protection conferred by the patent is limited in time (generally 20 years). 2.2 In a number of countries, inventions are also protectable through registration under the name of utility model or short-term patent. The requirements are somewhat less strict than for patents, in particular in respect of inventive step, and in comparison with patents the fees are lower, and the duration of protection is shorter, but otherwise the rights under the utility model or short-term patent are similar. 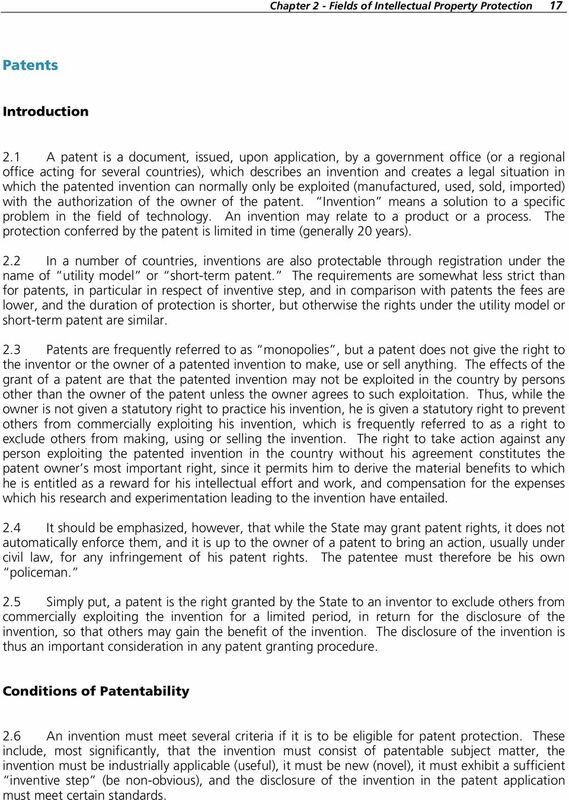 2.3 Patents are frequently referred to as monopolies, but a patent does not give the right to the inventor or the owner of a patented invention to make, use or sell anything. The effects of the grant of a patent are that the patented invention may not be exploited in the country by persons other than the owner of the patent unless the owner agrees to such exploitation. Thus, while the owner is not given a statutory right to practice his invention, he is given a statutory right to prevent others from commercially exploiting his invention, which is frequently referred to as a right to exclude others from making, using or selling the invention. The right to take action against any person exploiting the patented invention in the country without his agreement constitutes the patent owner s most important right, since it permits him to derive the material benefits to which he is entitled as a reward for his intellectual effort and work, and compensation for the expenses which his research and experimentation leading to the invention have entailed. 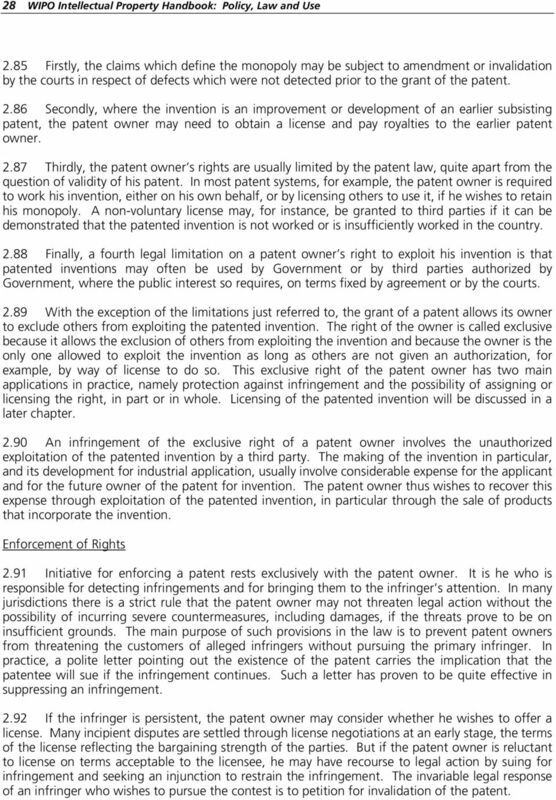 2.4 It should be emphasized, however, that while the State may grant patent rights, it does not automatically enforce them, and it is up to the owner of a patent to bring an action, usually under civil law, for any infringement of his patent rights. The patentee must therefore be his own policeman. 2.5 Simply put, a patent is the right granted by the State to an inventor to exclude others from commercially exploiting the invention for a limited period, in return for the disclosure of the invention, so that others may gain the benefit of the invention. The disclosure of the invention is thus an important consideration in any patent granting procedure. 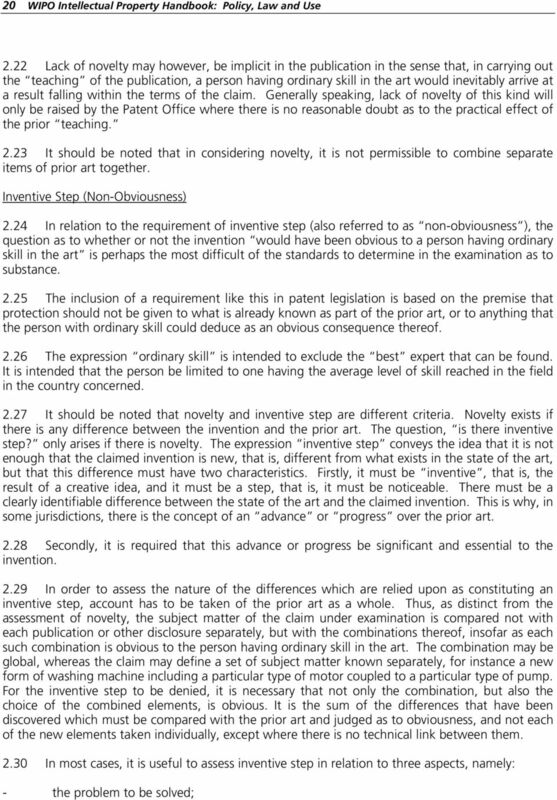 Conditions of Patentability 2.6 An invention must meet several criteria if it is to be eligible for patent protection. 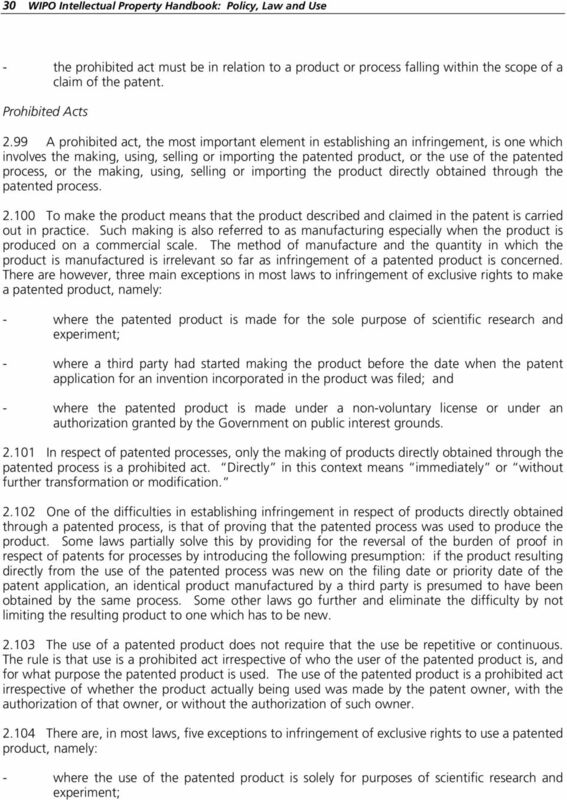 These include, most significantly, that the invention must consist of patentable subject matter, the invention must be industrially applicable (useful), it must be new (novel), it must exhibit a sufficient inventive step (be non-obvious), and the disclosure of the invention in the patent application must meet certain standards. 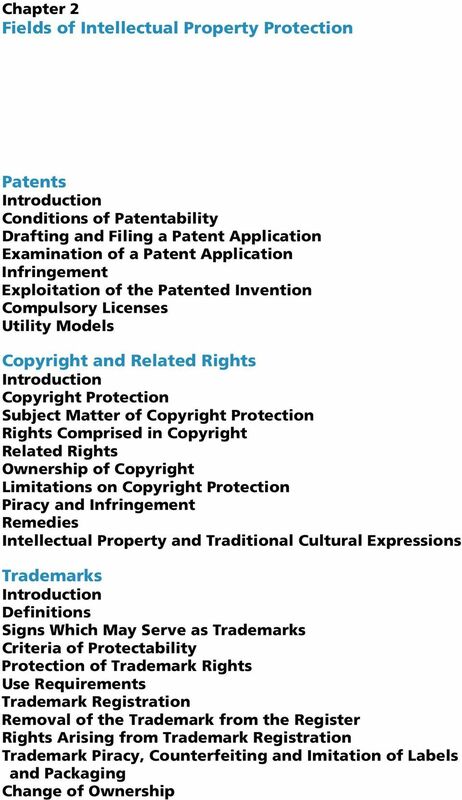 4 18 WIPO Intellectual Property Handbook: Policy, Law and Use Patentable Subject Matter 2.7 In order to be eligible for patent protection, an invention must fall within the scope of patentable subject matter. 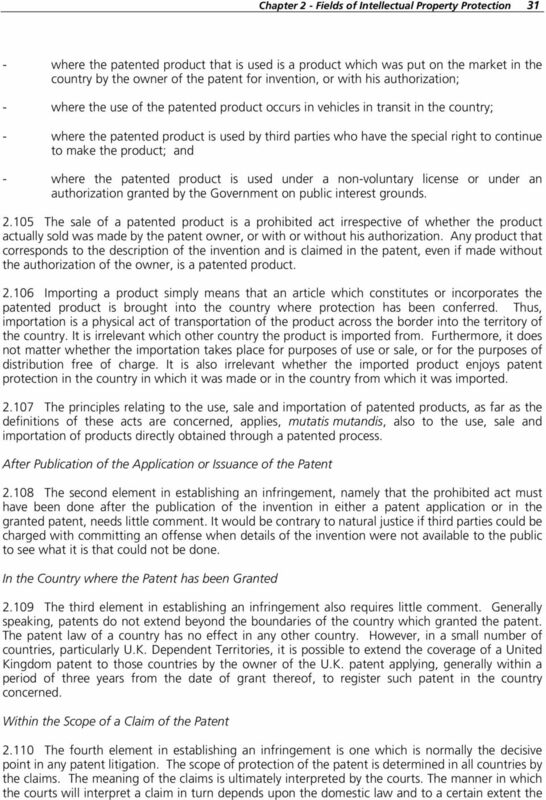 Patentable subject matter is established by statute, and is usually defined in terms of the exceptions to patentability, the general rule being that patent protection shall be available for inventions in all fields of technology (see Article 27.1 of the TRIPS Agreement). 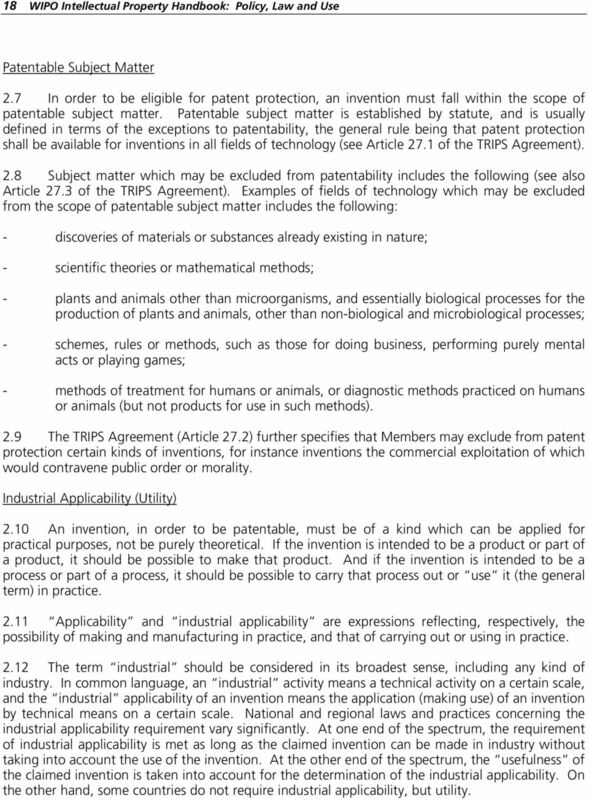 2.8 Subject matter which may be excluded from patentability includes the following (see also Article 27.3 of the TRIPS Agreement). Examples of fields of technology which may be excluded from the scope of patentable subject matter includes the following: - discoveries of materials or substances already existing in nature; - scientific theories or mathematical methods; - plants and animals other than microorganisms, and essentially biological processes for the production of plants and animals, other than non-biological and microbiological processes; - schemes, rules or methods, such as those for doing business, performing purely mental acts or playing games; - methods of treatment for humans or animals, or diagnostic methods practiced on humans or animals (but not products for use in such methods). 2.9 The TRIPS Agreement (Article 27.2) further specifies that Members may exclude from patent protection certain kinds of inventions, for instance inventions the commercial exploitation of which would contravene public order or morality. Industrial Applicability (Utility) 2.10 An invention, in order to be patentable, must be of a kind which can be applied for practical purposes, not be purely theoretical. If the invention is intended to be a product or part of a product, it should be possible to make that product. And if the invention is intended to be a process or part of a process, it should be possible to carry that process out or use it (the general term) in practice Applicability and industrial applicability are expressions reflecting, respectively, the possibility of making and manufacturing in practice, and that of carrying out or using in practice The term industrial should be considered in its broadest sense, including any kind of industry. In common language, an industrial activity means a technical activity on a certain scale, and the industrial applicability of an invention means the application (making use) of an invention by technical means on a certain scale. National and regional laws and practices concerning the industrial applicability requirement vary significantly. At one end of the spectrum, the requirement of industrial applicability is met as long as the claimed invention can be made in industry without taking into account the use of the invention. At the other end of the spectrum, the usefulness of the claimed invention is taken into account for the determination of the industrial applicability. On the other hand, some countries do not require industrial applicability, but utility. 5 Chapter 2 - Fields of Intellectual Property Protection 19 Novelty 2.13 Novelty is a fundamental requirement in any examination as to substance and is an undisputed condition of patentability. It must be emphasized, however, that novelty is not something which can be proved or established; only its absence can be proved An invention is new if it is not anticipated by the prior art. Prior art is, in general, all the knowledge that existed prior to the relevant filing or priority date of a patent application, whether it existed by way of written or oral disclosure. The question of what should constitute prior art at a given time is one which has been the subject of some debate One viewpoint is that the determination of prior art should be made against a background of what is known only in the protecting country. 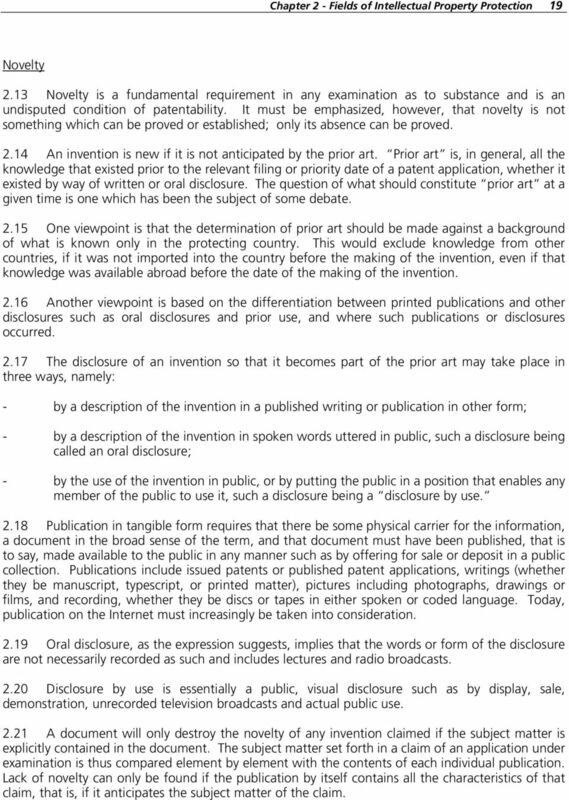 This would exclude knowledge from other countries, if it was not imported into the country before the making of the invention, even if that knowledge was available abroad before the date of the making of the invention Another viewpoint is based on the differentiation between printed publications and other disclosures such as oral disclosures and prior use, and where such publications or disclosures occurred The disclosure of an invention so that it becomes part of the prior art may take place in three ways, namely: - by a description of the invention in a published writing or publication in other form; - by a description of the invention in spoken words uttered in public, such a disclosure being called an oral disclosure; - by the use of the invention in public, or by putting the public in a position that enables any member of the public to use it, such a disclosure being a disclosure by use Publication in tangible form requires that there be some physical carrier for the information, a document in the broad sense of the term, and that document must have been published, that is to say, made available to the public in any manner such as by offering for sale or deposit in a public collection. Publications include issued patents or published patent applications, writings (whether they be manuscript, typescript, or printed matter), pictures including photographs, drawings or films, and recording, whether they be discs or tapes in either spoken or coded language. Today, publication on the Internet must increasingly be taken into consideration Oral disclosure, as the expression suggests, implies that the words or form of the disclosure are not necessarily recorded as such and includes lectures and radio broadcasts Disclosure by use is essentially a public, visual disclosure such as by display, sale, demonstration, unrecorded television broadcasts and actual public use A document will only destroy the novelty of any invention claimed if the subject matter is explicitly contained in the document. The subject matter set forth in a claim of an application under examination is thus compared element by element with the contents of each individual publication. Lack of novelty can only be found if the publication by itself contains all the characteristics of that claim, that is, if it anticipates the subject matter of the claim. 7 Chapter 2 - Fields of Intellectual Property Protection 21 - the solution to that problem; and - the advantageous effects, if any, of the invention with reference to the background art If the problem is known or obvious, the examination will bear on the originality of the solution claimed. If no inventive step is found in the solution, the question becomes whether or not the result is obvious or whether it is surprising either by its nature or by its extent. If a person having ordinary skill in the art would have been able to pose the problem, solve it in the manner claimed, and foresee the result, the inventive step is lacking. Disclosure of the Invention 2.32 An additional requirement of patentability is whether or not the invention is sufficiently disclosed in the application The application must disclose the invention in a manner sufficiently clear for the invention to be carried out by a person skilled in the art The description should set out at least one mode for carrying out the invention claimed. This should be done in terms of examples, where appropriate, and with reference to the drawings, if any. 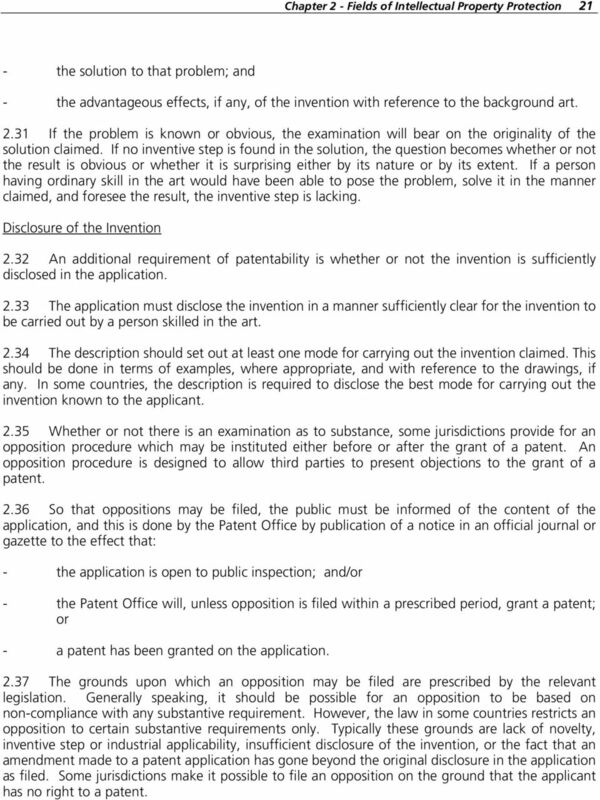 In some countries, the description is required to disclose the best mode for carrying out the invention known to the applicant Whether or not there is an examination as to substance, some jurisdictions provide for an opposition procedure which may be instituted either before or after the grant of a patent. An opposition procedure is designed to allow third parties to present objections to the grant of a patent So that oppositions may be filed, the public must be informed of the content of the application, and this is done by the Patent Office by publication of a notice in an official journal or gazette to the effect that: - the application is open to public inspection; and/or - the Patent Office will, unless opposition is filed within a prescribed period, grant a patent; or - a patent has been granted on the application The grounds upon which an opposition may be filed are prescribed by the relevant legislation. Generally speaking, it should be possible for an opposition to be based on non-compliance with any substantive requirement. However, the law in some countries restricts an opposition to certain substantive requirements only. Typically these grounds are lack of novelty, inventive step or industrial applicability, insufficient disclosure of the invention, or the fact that an amendment made to a patent application has gone beyond the original disclosure in the application as filed. Some jurisdictions make it possible to file an opposition on the ground that the applicant has no right to a patent. 8 22 WIPO Intellectual Property Handbook: Policy, Law and Use Drafting and Filing a Patent Application Identification of the Invention 2.38 The first task in drafting a patent application is the identification of the invention. This involves: - summarizing all the necessary features which in combination solve a particular technical problem; and - an examination of this combination to determine whether it would, according to one s own judgment, fulfill the requirements for patentability, especially inventive step It is during this process that a full comprehension of the essence of the invention is obtained, and this is important in helping to draft the description and claims Often the invention contains more than one new feature. It is essential to identify the critical feature or features and to have an explanation of why they contribute to an effective solution to the problem. There are two important reasons for this. First, the claims should be as broad as possible; the broadest claim is the one restricted by the least number of features. Second, having identified the critical features and their effect, it is then necessary to ask how else may this effect be achieved, that is, can the specific features be substituted or altered while still achieving the end result. This is important not only in drafting the claims, which must be wide enough to cover these substitutes or alternatives, but also in the description of the invention which must include details of the substitutes or alternatives so that the broad claim can be supported by the description. Practical Aspects of Drafting Patent Applications 2.41 Drafting practices and requirements differ from country to country. 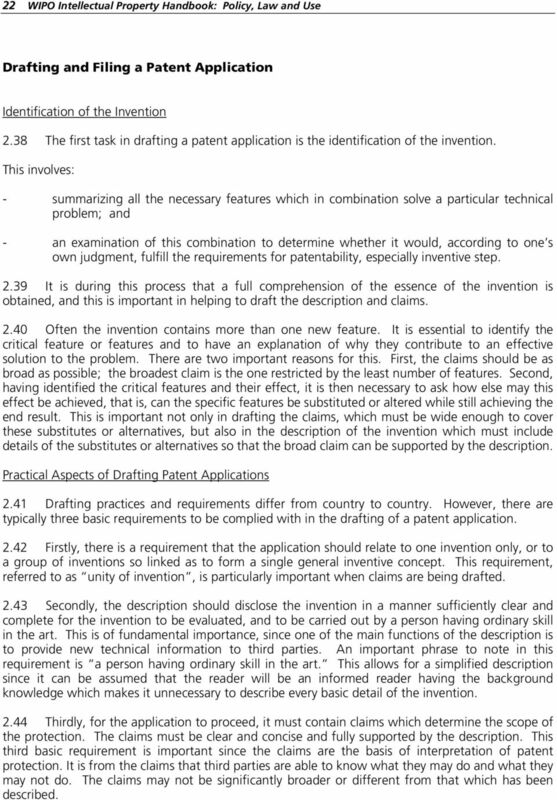 However, there are typically three basic requirements to be complied with in the drafting of a patent application Firstly, there is a requirement that the application should relate to one invention only, or to a group of inventions so linked as to form a single general inventive concept. This requirement, referred to as unity of invention, is particularly important when claims are being drafted Secondly, the description should disclose the invention in a manner sufficiently clear and complete for the invention to be evaluated, and to be carried out by a person having ordinary skill in the art. This is of fundamental importance, since one of the main functions of the description is to provide new technical information to third parties. An important phrase to note in this requirement is a person having ordinary skill in the art. 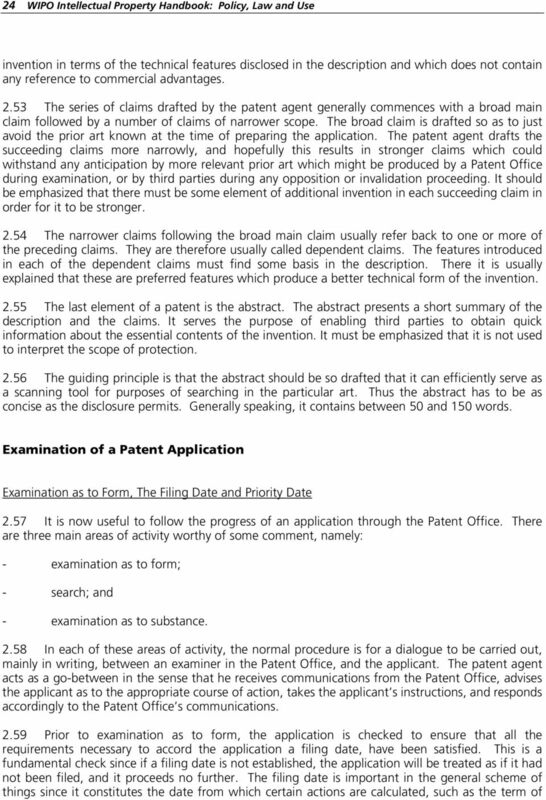 This allows for a simplified description since it can be assumed that the reader will be an informed reader having the background knowledge which makes it unnecessary to describe every basic detail of the invention Thirdly, for the application to proceed, it must contain claims which determine the scope of the protection. The claims must be clear and concise and fully supported by the description. This third basic requirement is important since the claims are the basis of interpretation of patent protection. It is from the claims that third parties are able to know what they may do and what they may not do. The claims may not be significantly broader or different from that which has been described. 11 Chapter 2 - Fields of Intellectual Property Protection 25 the patent, and, where appropriate, determines the priority date of any subsequent application in another country under the terms of the Paris Convention for the Protection of Industrial Property. The filing date (or priority date) is also relevant to the evaluation of novelty and inventive step The right of priority may be based on a national, regional or international application filed less than twelve months earlier. 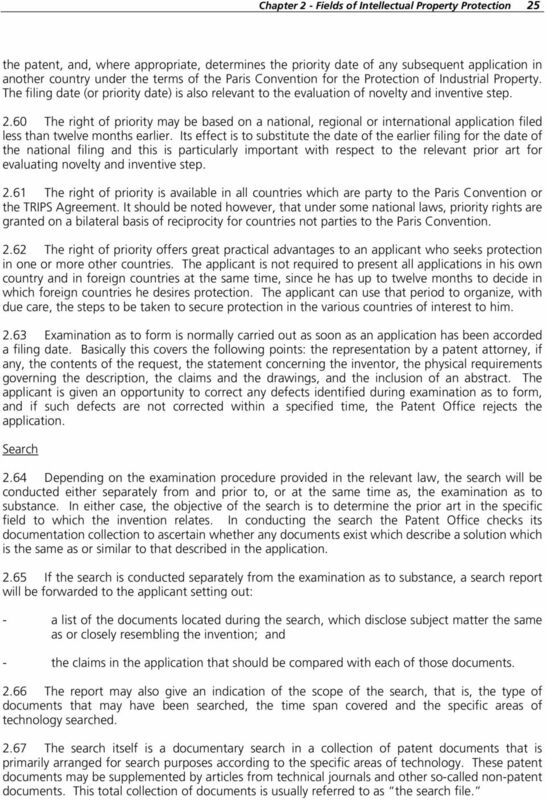 Its effect is to substitute the date of the earlier filing for the date of the national filing and this is particularly important with respect to the relevant prior art for evaluating novelty and inventive step The right of priority is available in all countries which are party to the Paris Convention or the TRIPS Agreement. It should be noted however, that under some national laws, priority rights are granted on a bilateral basis of reciprocity for countries not parties to the Paris Convention The right of priority offers great practical advantages to an applicant who seeks protection in one or more other countries. The applicant is not required to present all applications in his own country and in foreign countries at the same time, since he has up to twelve months to decide in which foreign countries he desires protection. The applicant can use that period to organize, with due care, the steps to be taken to secure protection in the various countries of interest to him Examination as to form is normally carried out as soon as an application has been accorded a filing date. Basically this covers the following points: the representation by a patent attorney, if any, the contents of the request, the statement concerning the inventor, the physical requirements governing the description, the claims and the drawings, and the inclusion of an abstract. The applicant is given an opportunity to correct any defects identified during examination as to form, and if such defects are not corrected within a specified time, the Patent Office rejects the application. Search 2.64 Depending on the examination procedure provided in the relevant law, the search will be conducted either separately from and prior to, or at the same time as, the examination as to substance. In either case, the objective of the search is to determine the prior art in the specific field to which the invention relates. In conducting the search the Patent Office checks its documentation collection to ascertain whether any documents exist which describe a solution which is the same as or similar to that described in the application If the search is conducted separately from the examination as to substance, a search report will be forwarded to the applicant setting out: - a list of the documents located during the search, which disclose subject matter the same as or closely resembling the invention; and - the claims in the application that should be compared with each of those documents The report may also give an indication of the scope of the search, that is, the type of documents that may have been searched, the time span covered and the specific areas of technology searched The search itself is a documentary search in a collection of patent documents that is primarily arranged for search purposes according to the specific areas of technology. These patent documents may be supplemented by articles from technical journals and other so-called non-patent documents. This total collection of documents is usually referred to as the search file. 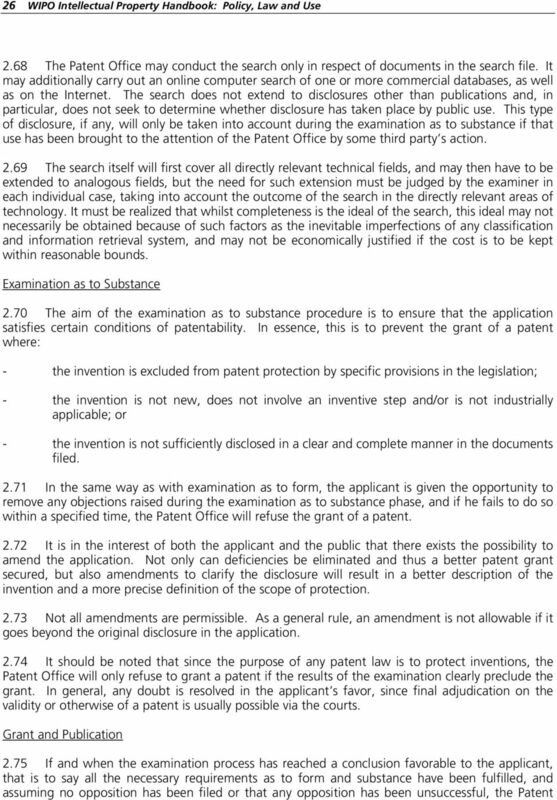 13 Chapter 2 - Fields of Intellectual Property Protection 27 Office will grant a patent on the application. This involves certain actions on the part of the Patent Office Firstly, when the patent is granted, the details of the patent are entered into the Patent Register. The Register usually contains bibliographic data such as the patent number, the name and address of the applicant/patentee, the name of the inventor, the original application number, the filing date, certain priority application details and the title of the invention. It does not contain any technical information Additionally in countries where annual fee payments are required in order to maintain the patent in force, the Register will contain details of when such fees have been paid, and may also list any details of licenses or assignments which may have been recorded The Register can thus be very useful to third parties especially competitors of the patentee, because it reveals the actual status of the patent. 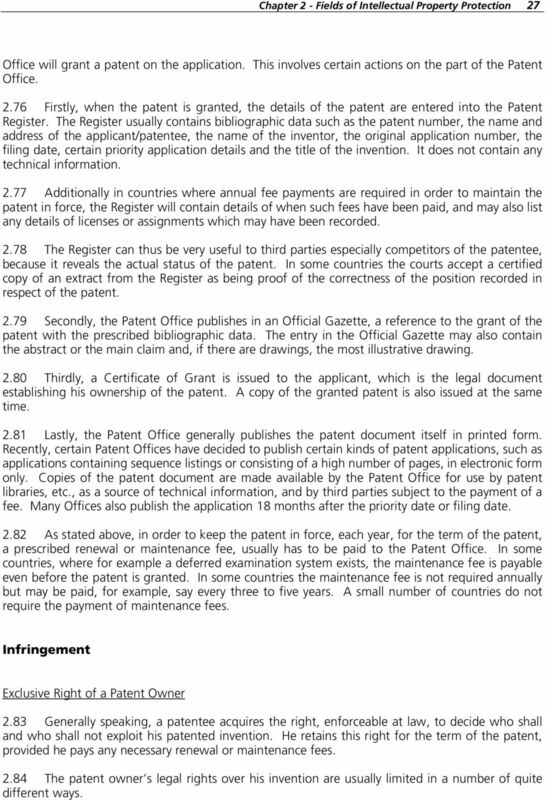 In some countries the courts accept a certified copy of an extract from the Register as being proof of the correctness of the position recorded in respect of the patent Secondly, the Patent Office publishes in an Official Gazette, a reference to the grant of the patent with the prescribed bibliographic data. The entry in the Official Gazette may also contain the abstract or the main claim and, if there are drawings, the most illustrative drawing Thirdly, a Certificate of Grant is issued to the applicant, which is the legal document establishing his ownership of the patent. A copy of the granted patent is also issued at the same time Lastly, the Patent Office generally publishes the patent document itself in printed form. Recently, certain Patent Offices have decided to publish certain kinds of patent applications, such as applications containing sequence listings or consisting of a high number of pages, in electronic form only. Copies of the patent document are made available by the Patent Office for use by patent libraries, etc., as a source of technical information, and by third parties subject to the payment of a fee. Many Offices also publish the application 18 months after the priority date or filing date As stated above, in order to keep the patent in force, each year, for the term of the patent, a prescribed renewal or maintenance fee, usually has to be paid to the Patent Office. In some countries, where for example a deferred examination system exists, the maintenance fee is payable even before the patent is granted. In some countries the maintenance fee is not required annually but may be paid, for example, say every three to five years. A small number of countries do not require the payment of maintenance fees. Infringement Exclusive Right of a Patent Owner 2.83 Generally speaking, a patentee acquires the right, enforceable at law, to decide who shall and who shall not exploit his patented invention. He retains this right for the term of the patent, provided he pays any necessary renewal or maintenance fees The patent owner s legal rights over his invention are usually limited in a number of quite different ways. 14 28 WIPO Intellectual Property Handbook: Policy, Law and Use 2.85 Firstly, the claims which define the monopoly may be subject to amendment or invalidation by the courts in respect of defects which were not detected prior to the grant of the patent Secondly, where the invention is an improvement or development of an earlier subsisting patent, the patent owner may need to obtain a license and pay royalties to the earlier patent owner Thirdly, the patent owner s rights are usually limited by the patent law, quite apart from the question of validity of his patent. In most patent systems, for example, the patent owner is required to work his invention, either on his own behalf, or by licensing others to use it, if he wishes to retain his monopoly. A non-voluntary license may, for instance, be granted to third parties if it can be demonstrated that the patented invention is not worked or is insufficiently worked in the country Finally, a fourth legal limitation on a patent owner s right to exploit his invention is that patented inventions may often be used by Government or by third parties authorized by Government, where the public interest so requires, on terms fixed by agreement or by the courts With the exception of the limitations just referred to, the grant of a patent allows its owner to exclude others from exploiting the patented invention. The right of the owner is called exclusive because it allows the exclusion of others from exploiting the invention and because the owner is the only one allowed to exploit the invention as long as others are not given an authorization, for example, by way of license to do so. This exclusive right of the patent owner has two main applications in practice, namely protection against infringement and the possibility of assigning or licensing the right, in part or in whole. Licensing of the patented invention will be discussed in a later chapter An infringement of the exclusive right of a patent owner involves the unauthorized exploitation of the patented invention by a third party. The making of the invention in particular, and its development for industrial application, usually involve considerable expense for the applicant and for the future owner of the patent for invention. The patent owner thus wishes to recover this expense through exploitation of the patented invention, in particular through the sale of products that incorporate the invention. Enforcement of Rights 2.91 Initiative for enforcing a patent rests exclusively with the patent owner. It is he who is responsible for detecting infringements and for bringing them to the infringer s attention. In many jurisdictions there is a strict rule that the patent owner may not threaten legal action without the possibility of incurring severe countermeasures, including damages, if the threats prove to be on insufficient grounds. The main purpose of such provisions in the law is to prevent patent owners from threatening the customers of alleged infringers without pursuing the primary infringer. In practice, a polite letter pointing out the existence of the patent carries the implication that the patentee will sue if the infringement continues. Such a letter has proven to be quite effective in suppressing an infringement If the infringer is persistent, the patent owner may consider whether he wishes to offer a license. Many incipient disputes are settled through license negotiations at an early stage, the terms of the license reflecting the bargaining strength of the parties. But if the patent owner is reluctant to license on terms acceptable to the licensee, he may have recourse to legal action by suing for infringement and seeking an injunction to restrain the infringement. The invariable legal response of an infringer who wishes to pursue the contest is to petition for invalidation of the patent. 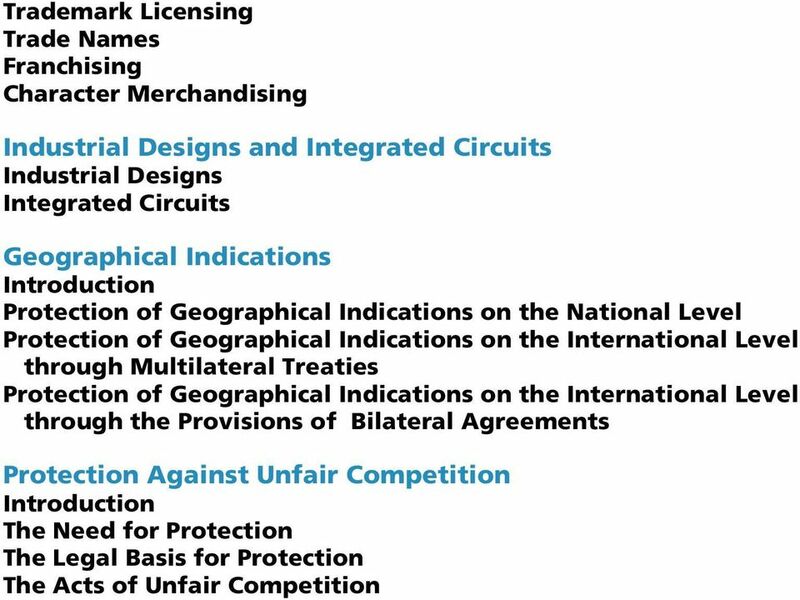 18 32 WIPO Intellectual Property Handbook: Policy, Law and Use rules or regulations. Therefore, what a claim means will depend upon the jurisdiction in which it is being interpreted The courts, particularly in common law systems, attempt to determine what structure the language of the claims defines, and whether or not the alleged infringing structure corresponds to the structure defined in the language of the claims In attempting to answer the question as to whether a particular structure infringes a particular claim of a patent for invention, the claim should be broken down into its individual elements, and these compared with the elements of the alleged infringement to see whether they fit. If the claim can, in fact, be made to correspond to the alleged infringement without stretching the words of the claim too far, then there may indeed be infringement. 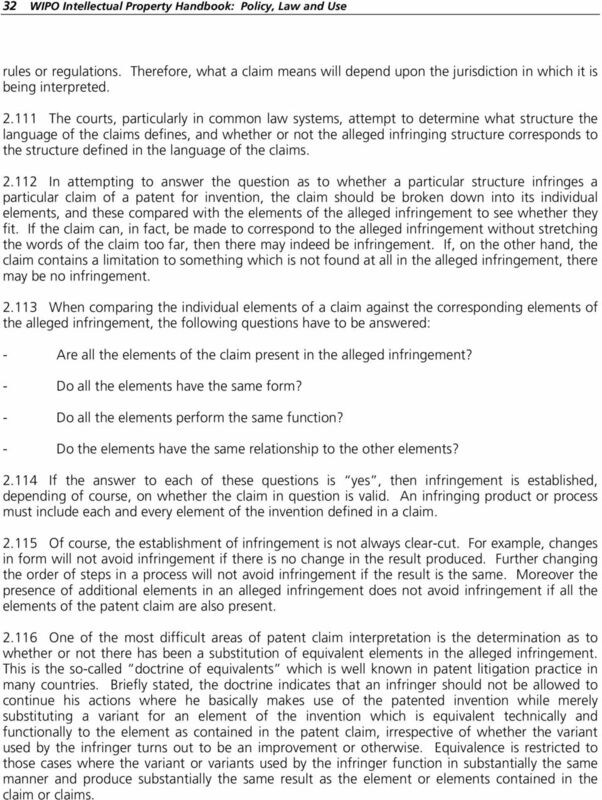 If, on the other hand, the claim contains a limitation to something which is not found at all in the alleged infringement, there may be no infringement When comparing the individual elements of a claim against the corresponding elements of the alleged infringement, the following questions have to be answered: - Are all the elements of the claim present in the alleged infringement? - Do all the elements have the same form? - Do all the elements perform the same function? - Do the elements have the same relationship to the other elements? If the answer to each of these questions is yes, then infringement is established, depending of course, on whether the claim in question is valid. 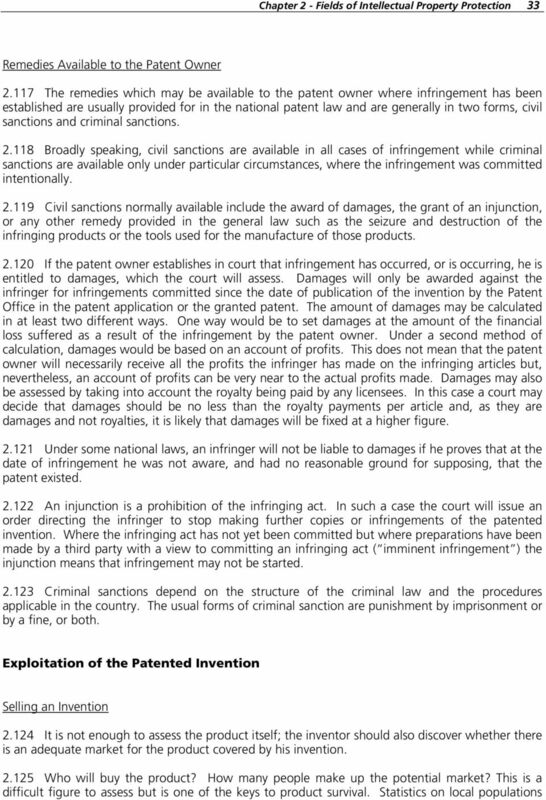 An infringing product or process must include each and every element of the invention defined in a claim Of course, the establishment of infringement is not always clear-cut. For example, changes in form will not avoid infringement if there is no change in the result produced. Further changing the order of steps in a process will not avoid infringement if the result is the same. 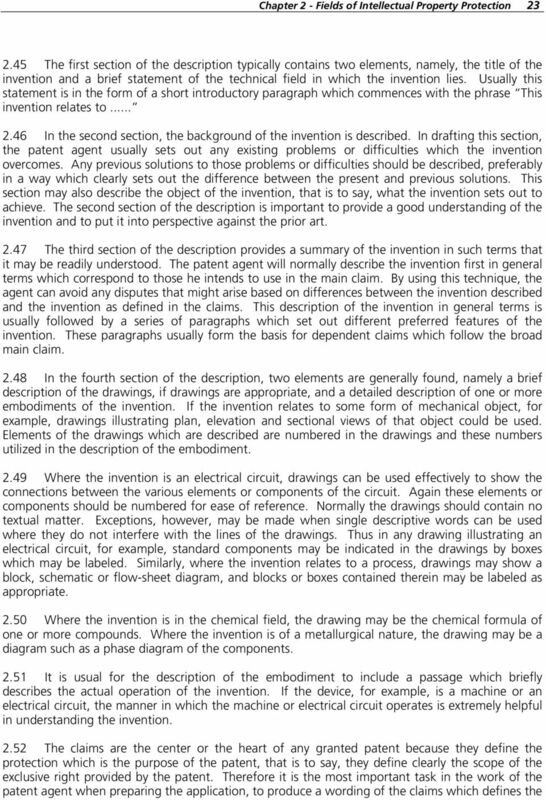 Moreover the presence of additional elements in an alleged infringement does not avoid infringement if all the elements of the patent claim are also present One of the most difficult areas of patent claim interpretation is the determination as to whether or not there has been a substitution of equivalent elements in the alleged infringement. This is the so-called doctrine of equivalents which is well known in patent litigation practice in many countries. 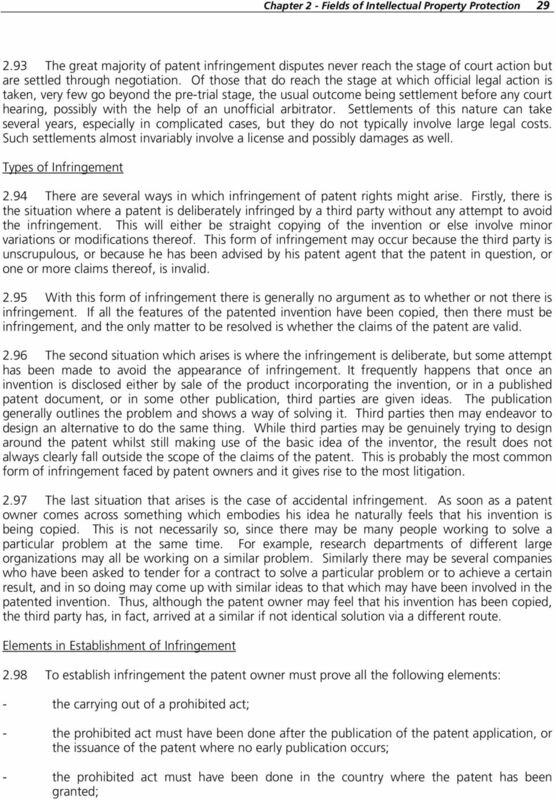 Briefly stated, the doctrine indicates that an infringer should not be allowed to continue his actions where he basically makes use of the patented invention while merely substituting a variant for an element of the invention which is equivalent technically and functionally to the element as contained in the patent claim, irrespective of whether the variant used by the infringer turns out to be an improvement or otherwise. Equivalence is restricted to those cases where the variant or variants used by the infringer function in substantially the same manner and produce substantially the same result as the element or elements contained in the claim or claims. 20 34 WIPO Intellectual Property Handbook: Policy, Law and Use and potential market segments published by the relevant government agencies, as well as surveys by private firms, can provide the basis for a study of the proposed market areas by age group, marital status and so on For some of the more sophisticated technology, research establishments, multinational corporations and the like are showing increasing interest in taking up embryo or partially developed technology with the object of completing development and thus gaining from the research effort and securing a significant lead over competitors Test marketing is a stage that many larger companies go through before commencing full scale production. They introduce the product in limited quantities to those viewed as a typical segment of their potential market. The small businessman also should consider using this technique before he commits too much time and money launching a product that ultimately may not sell Basically, there are two methods the inventor can use to get his idea into production. He can sell or license his product idea to a company equipped to manufacture it. Alternatively he can become a manufacturer himself, either establishing a factory or contracting out production to a job or machine shop if appropriate Some companies receive new product ideas with coolness. Often, companies are besieged with unsolicited ideas from the public, very few of which are even worth serious consideration. Larger corporations frequently have research and development departments in which substantial sums of money have been invested. Management, naturally, favors in-house developments. 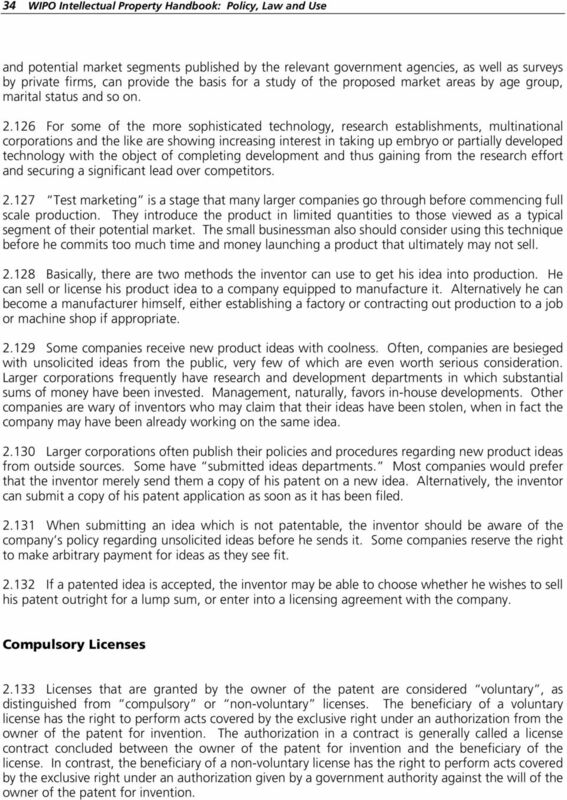 Other companies are wary of inventors who may claim that their ideas have been stolen, when in fact the company may have been already working on the same idea Larger corporations often publish their policies and procedures regarding new product ideas from outside sources. Some have submitted ideas departments. Most companies would prefer that the inventor merely send them a copy of his patent on a new idea. Alternatively, the inventor can submit a copy of his patent application as soon as it has been filed When submitting an idea which is not patentable, the inventor should be aware of the company s policy regarding unsolicited ideas before he sends it. Some companies reserve the right to make arbitrary payment for ideas as they see fit If a patented idea is accepted, the inventor may be able to choose whether he wishes to sell his patent outright for a lump sum, or enter into a licensing agreement with the company. Compulsory Licenses Licenses that are granted by the owner of the patent are considered voluntary, as distinguished from compulsory or non-voluntary licenses. The beneficiary of a voluntary license has the right to perform acts covered by the exclusive right under an authorization from the owner of the patent for invention. The authorization in a contract is generally called a license contract concluded between the owner of the patent for invention and the beneficiary of the license. In contrast, the beneficiary of a non-voluntary license has the right to perform acts covered by the exclusive right under an authorization given by a government authority against the will of the owner of the patent for invention. ROLES AND FUNCTIONS OF PATENT AGENTS The roles and functions of Patent Agents are determined by the domestic legislation of the territories and countries in which Patent Agents are registered to practice. Patent FAQs. What is a Patent? Why are Patents given? Why do I need a Patent? Patent FAQs What is a Patent? A patent is a legal right given to the patentee by the State to exclude all others from making, using or selling the invention for a certain period of time, usually 20 years. LICENCE FOR EMPLOYMENT APPLICATION. means Eversheds LLP whose registered office is at One Wood Street, London EC2V 7WS. Intellectual Property is the body of law that protects the fruits of human intelligence: our inventions, our creative works, and the logos and brand names that we adopt for the goods and services we sell. Maya Medeiros Lawyer, Patent Agent, Trademark Agent T: +1 416.216.4823 maya.medeiros@nortonrosefulbright.com http://www.nortonrosefulbright.com/people/99601/maya- medeiros PATENT ESSENTIALS WHAT IS A PATENT?